Do us Humans Use 10% of our Brain? Back in 2014, the film Lucy starring Scarlett Johansson and Morgan Freeman was released. It is about a woman Along with being released, Lucy brought back the popular saying, “The average person uses 10% of their brain capacity”. 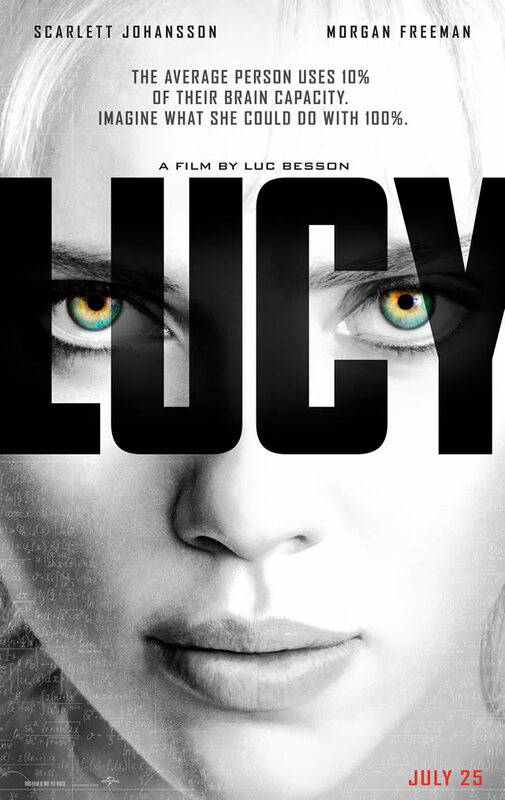 This can be seen in the Lucy movie poster below. Back when advertisements of the movie were being shown on TV nonstop, Morgan Freeman’s wise voice could be heard on the TV saying we only use 10% of our brain. If Morgan Freeman is telling you something, no matter what, with that voice, you’ll believe whatever it is. I mean, Morgan Freeman has played God before, after all. So let’s see if we actually use only 10% of our brains. Over the past 100 years, technology has advanced immensely in what we can learn about how the human brain functions. With instruments like EEG (Electroencephalography), the PET scanner, MRI machines, and other brain scanners, researchers have been able to pinpoint specific psychological functions to specific parts of the brain. Throughout all this research, not once, was a “quiet” or unused part of the brain was discovered according to Eric Chudler, director of the Center for Sensorimotor Neural Engineering at the University of Washington. With that being said, if there are no unused parts of the brain, then that means we use 100% of our brains. A little bit larger than the original 10% claim. Now before you think there is a global conspiracy, where scientists are lying about how we use 100% of our brains. Wouldn’t we know if someone discovered a certain part of our brain that wasn’t actually used? This entry was posted in Uncategorized on December 2, 2016 by Joshua Righter. Intersting idea, however Its wierd to think that because we use so much of our brain to perform simple functions. However, there are instance of people that have had traumatic injuries to more than 50 percent of the brain and are still fully functional, so I can see the possibility of that being true as well . Although I think the movie “Lucy” was a great film, I did not believe that humans only used 10% of our brains. As interesting as a concept the movie was, I too agreed it didn’t make sense that such a small portion of our brain was used. And you’re also right, people tend to hear or see a name and accept the credibility of the name more so than the statement they heard. I think humans love to believe that there is more to us than we know. Similar to how we believe in magic and the supernatural, the unknown is fascinating to us. Similar rumors like vaccines causing cancer are examples of how when something sounds credible, we believe it, without doing our due diligence. I found an article by sciencenews.com that addresses the idea of conformity and how easy it is for a handful of people to get an idea, even a false one, to spread like wildfire.